Update: Microsoft is now rolling out Windows 10 Mobile build 10.0.14393.594 for Insider Release Preview rings. Previously, only PC update was released. This update is expected to release to everyone next week. The company could also release update build 14393.693 for anniversary update users. Windows 10 cumulative update KB3209835 build 14393.594 and mobile build 10.0.14393.594 is now available for Insider Release Preview ring members. Release preview ring members can check their update for The Cumulative Update for Windows 10 Version 1607 for x64-based Systems (KB3209835). As reported earlier the update was compiled on December 13, 2016. 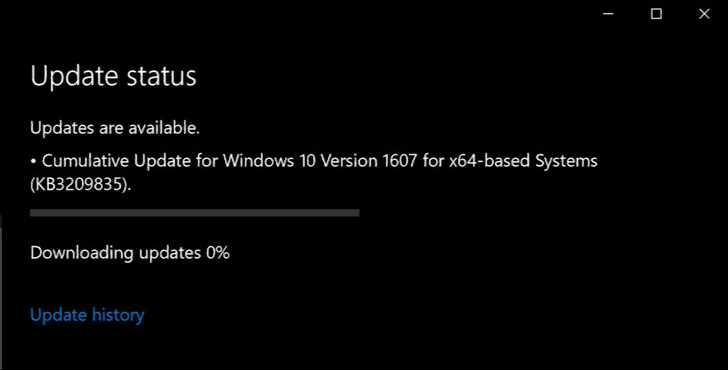 The update will push Windows 10 PC build 14393.576 to build 14393.594 and mobile built 10.0.14393.594. This cumulative update brings no new feature. But there are minor fix and improvements for Windows 10 devices. Microsoft yet to post the changelog for the update. We’ll update as soon as the company release the changelog. Offline files are in CAB format. Read how to Install a CAB and MSU File in Windows 10 for more details. Previously, Windows 10 cumulative update kb3206632 build 14393.576 for PC and mobile build 10.0.14393.576 was released for Windows 10 Anniversary Update users. The company also released cumulative update kb3198586 PC and Mobile build 10586.713 for Threshold 2 users. If you are facing download and installation issues with the cumulative update, check here for fixes. Microsoft will also release next Windows 10 Creators Update insider build this week. Windows 10 build 14986 ISOs are now available for download. You can download ISO from here.